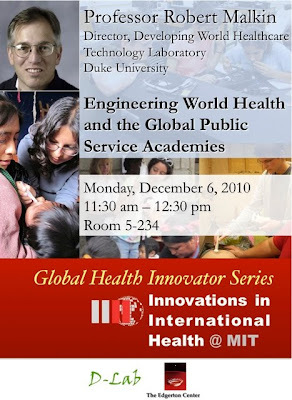 Just heard an excellent brief by Duke Professor Robert Malkin about his Developing World Healthcare Technology Lab and Engineering World Health and their efforts to develop medical devices for global health. Hosted by MIT's Innovations in International Health (IIH), Malkin gave several very compelling examples including the Duke Pouch for treating newborns. Plus he spotlighted several exciting field-practice opportunities for students through the Global Public Services Academies.